This fencing keeps out high-jumping deer. When you garden in deer country, growing vegetables can be a real challenge. 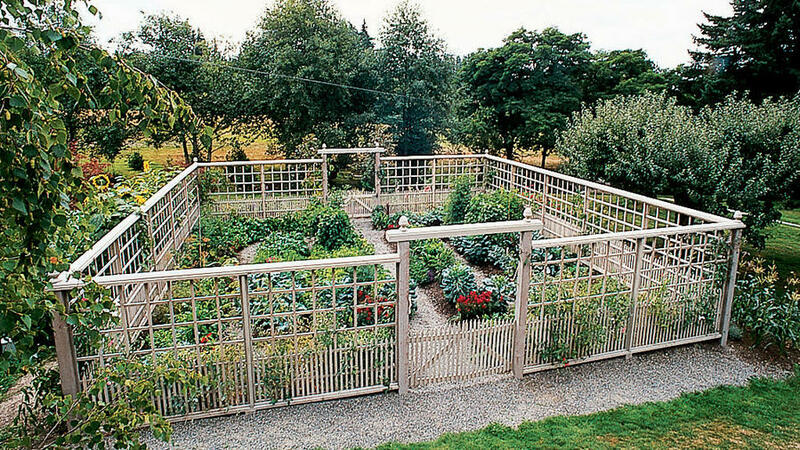 To keep out high-jumping deer, many gardeners surround their crops with tall fences that have the look of a maximum-security prison. That’s not the case in this enclosed garden in rural Redmond, Washington ― it’s surrounded by a graceful fence built by Harry Beal of Castle-n-Grounds, based in Duval, Washington. The design of the 10-foot-tall fence is adapted from a pattern the owner saw in a past issue of Sunset. Along the bottom of the fence, closely spaced pickets keep out small animals. A grid of squares made of 1-by-1s forms a deerproof barrier above the pickets. The fence is capped by 2-by-8s and beveled 2-by-6s. All wood is cedar, except for the pressure-treated corner posts topped by finials. Deer have never jumped over the swinging picket gates at the front and back of the enclosure, says Beal. Inside the 50-foot-square enclosure, vegetables that deer would otherwise devour grow along with flowers in raised mounds of compost and sand.